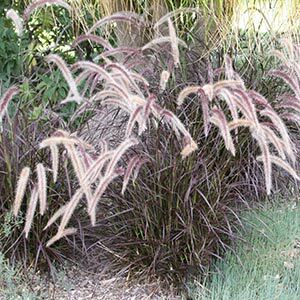 A highly ornamental grass Pennisetum advena Rubrum is commonly called ‘Purple Fountain Grass. Regarded as one of the best of all Pennisetums, this is not regarded as weedy as some others are. Offered for sale by wholesale growers in both Viro-tubes and larger pots. A popular landscaping grass Pennisetum rubrum is an ornamental perennial with an arching habit. A massed planting creates instant appeal in summer with tall seed heads reaching 1m to 1.5m in height. Clumps will spread to around 1m. Long foliage actually more reddish bronze than purple, but flower heads are purple fading to a yellow in winter. Although Pennisetum advena Rubrum is fast to establish itself it holds in good clumps. With the tall growth habit a attractive red tinged seed heads it make an excellent grass for a number of landscaping situations. In the garden border it can be planted in clumps to add interest through the year. It can be mass planted as a larger feature in commercial landscaping. Use it as low dividing screen in the garden to separate areas. Plant against walls and fences to soften the connection between the garden and buildings. An excellent choice on embankments, but equally at home in a container. This is a wonderful plant in many respects and a major attraction is that it is said to be a sterile hybrid, so no problems with invasiveness like some other grasses. In the border a single clump can act as a feature, or a lineal planting along a fence can work well. This is a clump forming grass that is a fairly rapid grower making it useful for larger projects. It does require a well drained soil and is reasonably tough and drought tolerant once established. Pennisetum advena Rubrum looks at its best when pruned back each year at the end of winter. In winter prune back before new growth is evident at the base of the plant, prune back to 25cm. Younger plants can be pruned with shears or seceaturs. Established plants will withstand a brush cutter. After pruning apply a slow release all purpose fertiliser and water well. Mulch around clumps with compost or other humus rich mulch. 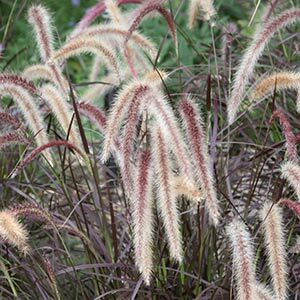 Pennisetum advena Rubrum grows well in full sun and this is the best position for good colour. Growth habit in a shaded position seems to be more sparse however still attractive. Frosts will in winter will burn off the foliage almost completely. Usually plants bounce back in spring with few problems unless frosts are very heavy and prolonged combined with extreme cold. Best in humus rich well drained soils that retain some moisture through summer. Best climate – Versatile and will grow well in cool, temperate, subtropical and tropical climates. Generally sold in Viro-tubes and Pots.